Cigarette girl is a striking addition to Belfast by night. A luxurious private bar for members and special guests, our Girl is inspired by the chain-smoking molls that prowled the speakeasies. Cigarette Girl is available for private hire Sunday – Friday. We can provide you with everything you need to make your party a night to remember, from canapes, drink receptions to DJs. Email us to request an application form to become a member of Cigarette Girl. To book one of our cosy Social Snugs, ask one of our staff for help. Sample our specialist cocktail list from a time gone by. The cocktail story is in keeping with the prohibition era of the 1920s and the cocktail revolution that followed. We’ve created a simple list using the freshest quality ingredients and the finest liquor from around the world. We’ve got classics from behind the speakeasies’ doors with classics of the modern era. So, hang up your temperance hat and come imbibe with us! The wine list at 21 Social has been created with the expert help of one of Northern Ireland’s leading wine distributors. Robb Bros are a family owned, independent wine merchant with years of experience in the field. At 21 Social we wanted a list that focuses on quality at all prices, whether it’s by the glass or bottle. We have wines to suit all occasions. From citrus packed Sauvignons to wines from the Marlborough region. Or try a robust and fruity red from the Glaetzer stable. 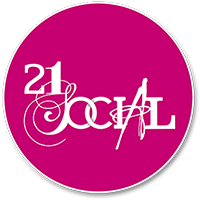 Whether its Old World or New World, at 21 Social you’ll find your favorite glass.